The number of births recorded in Ireland reached a twentieth century peak of 74.0 thousand in 1980 and fell to an all-time low of 48.2 thousand in 1994. Births began to increase in the second half of the 1990s and the rate of increase has been rapid over the past five years. The latest figures released by the CSO (Vital Statistics Third Quarter 2008) raise the possibility that the 1980 peak may soon be surpassed, although of course this would still imply a significantly lower birth rate as the population is now some 30 per cent above its 1980 level. The TPFR (total period fertility rate – roughly the number of births per woman over her child-bearing life span) declined from 3.23 in 1980 to a low of 1.85 in 1994 but was back up to 2.03 in 2007. These huge swings in the birth rate have serious implications for resource allocation, especially in the health and education sectors. The Dublin maternity hospitals are now bursting at the seams, while the educational system will continue to feel the impact of growing numbers of school-age children for years to come. Will the number of births continue to grow? Population projections are notoriously uncertain, at best serving to illustrate the implications of alternative assumptions about key demographic variables. The projections for 2011-2041 published by the CSO in April 2008 assumed that the TPFR would decline to 1.78 by 2011, which seems a high given the continuing buoyancy in the birth rate. But there are reasons for believing that the birth rate could suddenly take a nosedive, as happened in the 1980s. The peak in the number of births recorded in 1980 was quite dramatic and the subsequent rate of decline steep. (The decline began shortly after Pope John Paul II’s visit to Ireland in September 1979, when he preached against contraception and abortion.) More significant is that it coincided closely with the sharp rise in unemployment as Ireland entered the deep recession of the 1980s. The following graph shows the correlation between the number of births (four quarter moving average) and the seasonally adjusted numbers on the Live Register, lagged three quarters. 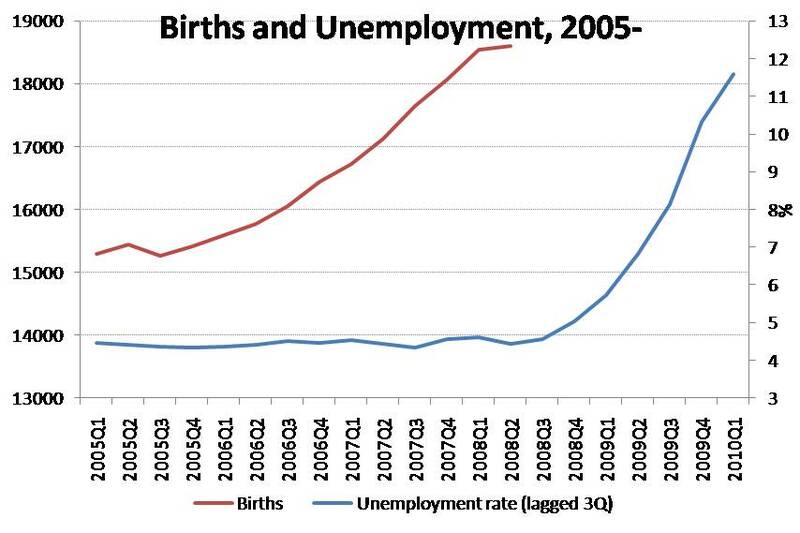 The coincidence between the peak in the number of births and the floor in the unemployment rate is striking. The second graph is the comparable picture for the years 2005 to date (using the standardised unemployment rate in place of Live Register figures). The unemployment rate began to increase dramatically in the second half of 2008, so it should begin to affect births registered from the second quarter of 2009 onwards. The latest available data are for 2008Q3, but it is interesting to note that the graph shows the number of births plateauing over the period 2007Q4-2008Q3. If the experience of the early 1980s is anything to go by, this graph will nosedive over the coming years. Watch this space! Fertility rates and births are difficult to forecast. 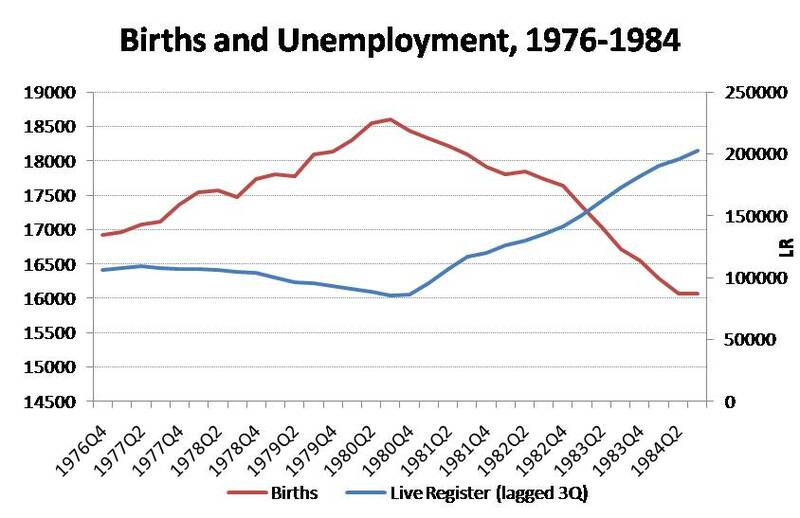 The impact of the economic cycle and unemployment on births is very uncertain. Rather than just focussing on the total number of births it is more instructive to look at trends in the Total Period Fertility Rate where the downward trend has been in place since the mid-1960s with a temporary and modest recovery from the mid-1990s to the present time. There is no evidence of a special effect in 1979-1980. Births peaked in 1981 due to female age-structure effects but the TPFR declined for each of the years in the late 1970s and early 1980s. Ireland displayed a trend which was apparent in other English-speaking countries with a rough lag of 15 years. Regarding future unemployment trends and births – it is likely that TPRF will fall in the very long-run and quite possibly in the short-run too. How the recession will impact is hard to say. Cohort, period and cyclical components of FPFR trends are hard to disentangle. The total number of births is what matters for projecting the demand for hospitals, schools, housing etc. This depends on (i) the number of women of child-bearing age and (ii) the TFR. The former is the bigger source of variation and is volatile due the impact of net migration, but the latter also varies significantly. If you look at a graph of the TFR since 1960 you will see that it varies pro-cyclically around a declining trend. It was above trend between 1962 and 1981, below trend between 1982 and 1997, and above trend between 1998 and 2007. If the rate of decline recorded in the 1980s and early 1990s had continued, our TFR would now be down to 1.5 (which is actually the average for the EU today). So I expect that the Great Recession will cause it to fall sharply in the coming years. But a resumption of net emigration among the population aged 20-40 will have a bigger impact on births. Don’t forget that I lagged the unemployment rate by three quarters! In the early to mid 1980s there was a lot of comment about huge class sizes in Primary schools. There were teachers’ strikes, protests and endless talk about strikes for most of the ’80s, as I recall (mostly about pay, of course…). Then, in the mid 1990s, the points requirements for third-level courses got incredibly high, as the points system is based as much on supply-and-demand as academic achievement. Also student accomodation, or lack thereof, was a recurring story every summer at that time. The house price/building boom then really took off at the turn of the century as professionals in their twenties all looked to get ‘on the ladder’. More anecdote/coincidence than serious study I know, but I only mention all that because the effects on services and society of that late ’70s baby population bulge as they aged are rarely discussed. For example the amount of available college courses jumped in response to the demand of the mid ’90s and then the points requirements for almost everything collapsed in recent years due to oversupply – as if the people running the universities hadn’t noticed there were going to be thousands fewer doing the Leaving Cert (even ignoring the effects of school leavers going straight into the construction boom workplace). We should always be wary of long-term forecasts for population, birth and death rates, and net migration in Ireland. Past experience shows that these are nearly always totally wrong. The worst example appeared in a major report of future population trends published by a group of consultants around 1990. From memory, I think the consultants were DavyKelleher. But, apologies if this is incorrect. The report caused quite a stir at the time. Although he had nothing to do with the production of the report, the findings of the report were reviewed by Professor Brendan Walsh in the Irish Times. In his review, Professor Walsh was very sceptical of the report’s findings and very sceptical of the abilility of population ‘experts’ in general to forecast future population trends. These turned out to be wise words, since the forecasts published in the report turned out to be among the most inaccurate forecasts ever made. The DavyKeller (?) report forecast that the population would fall from 3.5 million then to 3.3 million round about now, with an even larger fall forecast for the population aged 15 to 34. The report forecast that the annual number of births, which had fallen in the previous decade, would continue to fall and that net emigration would persist throughout the period between then and now. In the event, virtually every forecast in the report turned out to be hopelessly wrong. The population increase between then and now amounts to almost 35%, the fastest rate of population growth seen in the developed world for a century. There has been an even larger increase of almost 50% in the population aged 15 to 34 (at a time when this section of the population has been falling in number in most EU countries). This, by the way, was/is the driver of the housebuilding boom, rather than anything the banks have done. While the annual number of births continued to fall for only a year or two after the publication of the report and, as Professor Walsh shows in his post opening this thread, has been rising ever since. And, as for the forecast continuing net emigration, again this turned out to be hopelessly wrong. The fact that the forecasts in the report turned out to be complete turkeys isn’t just a matter of academic importance. The infrastructural deficit Ireland suffered in the late 1990s and early 2000s, and which is only now being eliminated, was largely due to the planners basing their assumptions on the 1990 DavyKelleher (?) population forecasts. It is imperative that this mistake is not repeated! At the moment, in the prevailing mood of manic pessimism (which itself is reminiscent of 1990), it is fashionable to forecast long-term decline in population and a resumption of massive long-term net emigration. I don’t rule out the possibility that these could occur (I am not psychic), but I see no reason to think that they will and I see no reason to think that they are inevitable. They obviously could occur if bad policy decisions are made by those in government. But, given any kind of reasonable governance, the probability is that they will not occur long-term, although, they could in the short-term if Ireland’s economic cycle diverges from that of other countries. As I say, not being psychic, I don’t how if the demographic trends of the past 15 years will continue or will be reversed. But, I have no doubt that it is in Ireland’s interest that they should continue. It should be a key element in government policy to ensure that Ireland’s high birth rate is kept up and that there is continuing net immigration and high population growth. The combination of these over the past 15 years has given Ireland by far the best demographics in Europe and Ireland is largely missing out on the demographic timebomb that is going to severely damage the economies of most European countries in the next few decades, as the proprtion of the pension-collecting non-working population aged 65 plus increases to unsustainable levels. (d) Ireland has by far the lowest proportion of its population aged 65 plus. This gives Ireland a huge competitive adavantage as there is far less need for high taxation levels to support the pension-collecting non-working population. (e) Although Eurostat projections are for the proportion of population aged 65 plus to increase in Ireland by 2016, it is forecast to increase everywhere, and the differential between Ireland and other EU15 countries is actually forecast to widen between now and 2016. What is more, the Eurostat projections for Ireland in 2016 were produced in 2005/06, when it was assumed that the fertility rate in Ireland would continue to fall. As Professor Walsh shows in his post opening this thread, Ireland’s fertility rate has actually risen sharply since 2005/06. If it can be maintained at its 2008 level rather than its 2005/06 level (which I argue should be a key element of government policy), the differential between Ireland and other EU15 countries will be even wider than that shown in the table below. (f) Although not shown in the tables below, the demographics of eastern Europe are even worse than those in western Europe (with Ireland being the shining exception). In most eastern European countries, the population is falling as the number of deaths exceeds the number of births, the fertility rate has fallen to levels barely more than half that currently in Ireland, and the number of abortions exceeds the number of births. Per the CSO 1 in 6 births are to foreign nationals which is c12000 babies. This is presumably a relatively recent phenomenon which wouldn’t have been predicted back in 1990 and how it pans out from here will have a major bearing on the figures. @BW – only spotted the lag afterwards. Mea culpa! @ John — your proposal sounds like a Ponzi scheme. There are too many people over 65 needing health care and retirement benefits and so your solution is … increase the population. Doesn’t this delay the problem, while making Ireland more crowded, less pleasant for all, and more environmentally damaged? What you suggest is a dynamically-inconsistent solution and bad environmental-demographic planning. A more thoughtful proposal is needed that does not involve unending population growth. If you are worried about the proportion of the population over 65, because they need health care and retirement benefits, then you should fear far more for other countries than Ireland. As the table I gave shows, that proportion is far lower in Ireland than in any other EU country. Its barely half in Ireland what it is in Germany. One of the reason’s is Ireland’s high fertility and birth rates, and low abortion rate. Massive population growth rates are not healthy for society or the environment. They create more problems than they solve and store up more problems for the future. Water use, infrastructure stress, contribution to global warming, inadequate housing stock, gridlocked transport, and others. So you are solving one or two short-term problems by creating lots of big long-term ones.